Here is my poor, invalid Hubby. His new home is our living room which is now decorated in what I like to call "Hospital Chic". Ha! But seriously, we live in, what is quite possibly one of the best neighborhoods in the entire world. They have really rallied around us since John's accident. That cushy chair you see him in is a lift chair that our neighbors brought over to us. It's amazing...reclines all the way back...lifts him almost all the way up when he needs to stand. Today at his follow up appointment, we discovered he still has some fluid in his lung. If it's still there by this time next week, he'll need another chest tube. Here's praying that all our hard work this coming week will prevent that from happening. That means lots of lung exercise, and trying hard to get up and walk more. But, despite all his pain, he's a trooper. When I told him I didn't have a post for Frugal Friday this week, he told me I could post his picture and say that my carpenter was "out of order". I thought it was funny. Thank heavens he still has a sense of humor...we're going to need it. It's your turn! INSPIRE ME this week folks...I sure could use it!!! 3. Please comment! Show our participants the love! Oh, and don't forget...you have until midnight tonight to enter the Rusted Chain giveaway...click here. oh my! It's not going to be easy. I truly hope your hubby has a full (speedy) recovery. Take care of yourself cause it's going to be tough for you too. OH what a sweetie to let you take his picture!! Our thoughts and prayers are with all of you. Hope you're getting enough rest. Oh gosh, poor guy!!! My thoughts and prayers are with you, your husband, and your whole family. I'm sure it's not been easy for any of you. I hope he recovers quickly! What a trooper! So glad he's at least able to get up...although that must be a painful undertaking. I will pray for his continued and speedy recovery and for the lungs to clear up too. All the best to your hubby for a speedy recovery. Still praying for a fast recovery! I'm just now catching up on what happened with your poor husband. I have to say my heart skipped a beat when I read some of your earlier posts. So glad he's ok and that you're both coping so well! Continued good wishes for a speedy recovery! Hoping you'll have your carpenter back in no time! Good people (neighbors) make all the difference at times like this. I hope he's able to get the rest and exercise needed for his complete recovery. A sense of humor is so important and it's good to know you both have that to get you through these rough times. Positive thoughts and prayers coming your way. I hope your hubby's recovery continues at a rapid pace. Prayers are with you. Thanks for hosting. Hope your guy has a speedy recovery! Positive thoughts to you and your family. Ah, that doesn't look fun... Hope he heals real quick! Amen for neighbors! My dad just got one of those chairs for his recovery from neck/spine surgery and it was awesome! So glad you have one to use...it's so helpful! I don't have any Frugal Friday inspiration because my blog posts have been full of wedding beauties, but I want to tell you that I'm so glad your husband is at home with you and on the mend. Having a sense of humour is a great sign of healing. Here's hoping he will soon be "back in order." Your poor hubby! :( What a blessing to have an amazing neighborhood... praying for all the fluid to be gone from his lungs! Thanks for your fabulous blog. I'm a frequent visitor. Best wishes to your husband. You take care. Sending my best to each of you as you mend. Thanks for hosting during this challenge. You are a trooper, along with your courageous carpenter! I do not think I have ever posted a comment here, but wanted to let you know I am praying for you and your family. I cannot imagine my husband being laid back like that and in pain. The picture broke my heart. I will be praying your "carpenter" gets on the mend quickly. So thankful that you have the loving support of neighbors and friends. Prayers from VA being sent your way, my sweet friend. Hang in there! I will pray that the fluid clears up so he will not have to undergo another procedure!!! Blessings for a restful weekend! I'm so glad to read that your husband is home and resting. One step closer to recovery! Hey, he's still handsome, even in a leg brace. Not everyone can rock that look. It's good that you've got a lot of support and help with this. It's also good that you're rock solid strong. Lifting up your husband in prayer. I can't remember if I mentioned this before, but my husband had a brain aneurysm almost 2 years ago. I had to learn to ask for help and receive it. I always had a strong front and didn't want to appear weak, but I had to accept help. Have a short list of things you need help with and those who ask, say 'As a matter of fact...'. Also, find some time to destress somehow. I know when my husband was in Neuro ICU, the showers were in a separate private bath away from the rooms. I remember taking a shower and just bawling and crying out to God to save my husband's life. Of course, then I would get dressed, come back out and put on the mask that I was strong. Don't be afraid to not be strong. Sorry this was so long. Will be praying for no fluid and more mobility somehow! Sending you a huge hug that you can be strong and have the energy and courage to help your family through this time with your husband and father. Playing it solo is never never easy! May Heavenly Father bless you with added patience and a sense of humor. Our family will keep you in our prayers. So glad you can count your blessings and that your hubby still has his sense of humor. Thanks for sharing. So glad he is home. Glad he is holding strong!! He'll get better even faster now, being home. We are still praying for him and for your dad. I'm so glad your husband is ok, despite being laid up. I keep thinking about my own little family and can't imagine what you're going through. You'll be in my thoughts and prayers. Stay strong. Hey Wendy- So glad to hear that your husband has his humor back...everything else will soon follow. It's so nice to see how supportive the neighborhood has been for you guys, it makes a world of difference. bless his heart he still has a sense of humor. been praying for y'all. will continute to lift y'all up in prayer. i wish you and your hubby the best. keep on him to use that incentive spirometer. that should help his lungs function. those are good little devices. they really do help! gos bless you and your family. Best wishes to you and your hubby. 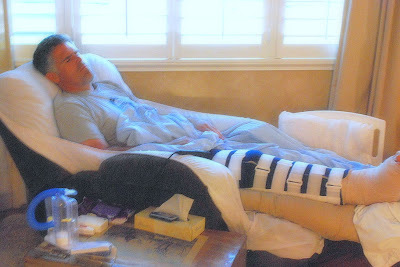 My husband had ACL surgery a week ago and is laid up in the living room as well, but I'm going to count my blessing that it isn't worse. It only takes a story like yours to realize I have it great. Sincerely good luck. Heres hoping alls good with your dear hubby, and that he is soon back on his feet. I hope that your hubbhy gets well sson. With your yender loving care it will speedy, efficient and soon. Please take care of yourself also. I'm just getting up to speed on the accidents your husband and father were in. Praise the Lord they are both ok and healing. I hope He will give you unending strength through this period and your kids will have a peace and calm through it all. I am praying that you guys all have a good week and that the carpenter continues to improve. How wonderful that even through the pain and stress he still has a sense of humour. Thanks for hosting this. I found many lovely projects and commented on them.